Let Good Characters help you develop a comprehensive list of potential Chinese versions of your business name as fast as 14 days so you can register and protect your brand in mainland China, Hong Kong, and Taiwan. Good Characters—that’s who we are; that’s what we do. Tell us about your company, your brand, your products, your services, and your business aspirations regarding China. Our naming specialists will go to work and create a list of great name candidates for you. Whether your style is to sit back and relax while the experts do their work or be fully involved in every step of the process, we are the obvious choice for you. We have been crafting Chinese names for over a decade and have perfected our naming processes through experiences in thousands of large and small naming projects. Our unsurpassed expertise in Chinese naming ensures your results to be not only successful, but exceptional. Startups hire us because we’re fast, easy to work with, and within their budget. Fast: Two weeks, not two months. Easy to work with: Responsive via phone, text, and email. Even though billion-dollar-company CMOs often feel more comfortable hiring a big name branding agency because “nobody ever got fired for buying IBM,” smart executives hire us in parallel or as a backup because they know we provide more names faster and with in-depth analysis. As you've already heard, for over a decade we have helped American businesses from start-ups to Fortune 500 companies, from the Silicon Valley to Shanghai, create Chinese names for their companies, their products, and their services. Our clients have been pleased with our service and have initiated powerful and profitable cultural connections with the Chinese. 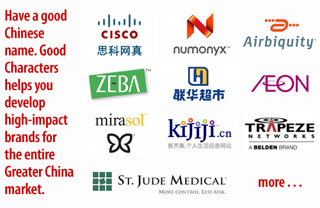 We provide some of the fastest Chinese naming, which is an advantage in the hyper-paced Chinese market. One Shanghai-based brand consultancy was described in a major newspaper as typically “arriving at a proper name” in “four to 12 weeks.” That's one to three months. We are able to deliver your name candidates within two weeks because we are highly specialized and efficient in Chinese naming. Our world-class first-mover clients demand quick turnaround times. You’ll be informed at every step of the process and receive both a full list and a short list, weighted and ranked according to your branding criteria so you can immediately start the process of registering and protecting your brand name in China. You and your team also have access to your password-protected project site to review, examine, and experiment with different variables and provide feedback on the Chinese name candidates. You will also appreciate having the in-depth naming report in PDF, PowerPoint, or Keynote written fluently in English so you and your boss can make an informed naming decision. Our operating cost is lower. Agencies in big cities have impressive offices and large staffs. We have a modest office in a small city. Our location mean less overhead. Its quiet environment surrounded by natural beauty is conducive to creativity, sparking higher quality ideas than would be generated in a noisy, distractive, urban setting. We specialize. Other agencies offer not only naming, but also other branding related services. We devote all our attention to creating the best Chinese name candidates for you. You are not paying for staff time spent on bells and whistles. Our expertise provides you with a roadmap for developing high-impact brands for the entire Greater China market. We have helped businesses, from start-ups to multinational companies, from the Silicon Valley to Shanghai, create Chinese names for their companies, their products, and their services. Our clients have found success in translation and have initiated powerful and profitable cultural connections with the Chinese. The following is a partial list of some of our projects. Whether you are a start-up or a multinational company, we have the expertise and experience to create the best Chinese name for you. Copyright © 2001-2016 Good Characters, Inc. 14 years of great Chinese names. California, U.S.A.